1) Reassure your audience - they need to know you know your stuff and you are human! 2) Hook them by being interesting and relevant. Tell them why what you are saying is relevant to them. 3) Inspire them by giving them information and ways of seeing that are new and applicable. 4) Leave them on a high by telling a story them encapsulates your central message. Here's some tips, some of which are practical, some of which are to do with the way you think about your public presentations and also how you can start to change the way you feel about them. Tip One: Breath your way to calm. When you breath out you relax that's why people sigh when they're stressed. Breathing in without breathing out causes hyperventilation and worsens anxiety. Just before your speech take five minutes breathing in to the count of seven and out to the count of eleven (quick count-not seconds!). On the out breath hold it a second before breathing in again. This will produce quick and lasting calm. Remember extending the out breath calms you down. Tip Two: You have a responsibility as the presenter but relax you don't carry all the responsibility. Presenting is a team effort. Audiences are responsible for politeness, extending their attention and attempting to learn. It's not all you-it's a meeting of two halves. Never mind how they judge you. How do you judge them? Tip Three: Use metaphor and stories. We all experience life metaphorically. The most technical logical person spends at least two hours a night dreaming! Talk detail if necessary but present patterns with metaphors. Folk from 4 to 104 love stories. Use em. Tip four: Captivate attention by using words that evoke all the senses. Describe how things look, sound, feel, smell and taste. Paint pictures and sensations in their minds with your words. Tip Five: Vary your voice tonality and speed of delivery. Keep them alert and engaged. Convey energy when need be and slow down when you need to 'draw them in close.' You are the conductor to their orchestra. And pepper your talk with humour. Your willingness to be funny shows personal confidence and confidence is contagious. Tip Six: Tell them what they are going to get. What they are currently getting and then what they have got from you. Sell your sizzle! Tip Seven: Watch and learn from other great speakers until compelling, relaxed speaking is a part of you. Rehearse positively. You need to rehearse how your going to feel as well as what you are going to present. Don't think about your forthcoming presentation whilst feeling nervous as this creates an instinctive association between fear and presenting. This natural negative self-hypnosis is very common with nervous speakers. 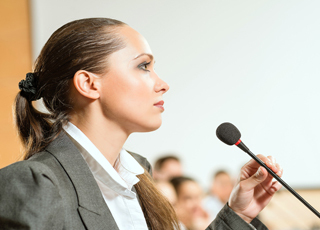 Hypnotically rehearse your speech whilst feeling relaxed. This produces the right 'blueprint' in your mind. In fact when you do this enough times it actually becomes hard to be nervous! All great speakers know how to use great self-hypnotic rehearsal. Hypnosis changes attitudes and can bring emotion under control. I used hypnosis, to change my instincts around public speaking. Now I just can't get nervous whether it's 50 or 500 people. The world needs great communicators. Go for it! Please browse our fully updated library of professionally produced Hypnosis Downloads and Hypnosis Scripts for advanced self hypnosis audio mp3s and indirect hypnotherapy scripts relating to: 7 public speaking survival tips, confident public speaking, fear of public speaking, fear of speaking in groups, fear of speeches, glossophobia, public speaking advice, public speaking anxiety, public speaking fear, public speaking tips, speech anxiety. Please browse our Hypnosis Online Store for books, cds, downloads, dvds, ebooks, mp3s, scripts, and videos relating to: 7 public speaking survival tips, confident public speaking, fear of public speaking, fear of speaking in groups, fear of speeches, glossophobia, public speaking advice, public speaking anxiety, public speaking fear, public speaking tips, speech anxiety. Please visit Hypnotic-world.co.uk for advanced self hypnosis audio mp3s, hypnosis courses, and hypnosis pdf relating to: 7 public speaking survival tips, confident public speaking, fear of public speaking, fear of speaking in groups, fear of speeches, glossophobia, public speaking advice, public speaking anxiety, public speaking fear, public speaking tips, speech anxiety. Please visit Hypnotic-world.com for more information relating to: 7 public speaking survival tips, confident public speaking, fear of public speaking, fear of speaking in groups, fear of speeches, glossophobia, public speaking advice, public speaking anxiety, public speaking fear, public speaking tips, speech anxiety.